You know you're a polish addict when your nail polish gets its own email address. More times than I care to admit, I've returned home from the store with the exact same polish I already own. It's like I'm drawn to the same colors over and over again. There are some amazing polish stash spreadsheets out there (examples at the end of this post), but I wanted something I could easily manage with my iPhone...which my husband says I cradle in my hand while I'm sleeping. I seriously do not let go of that phone! So today, instead of a mani, I'm going to show you my system for Trackin' the Stash. This may not be the best way, but it's the way I do it. This technique uses a Gmail Contacts List to store polish names and info. I can get to this list from any computer or my phone and it's always updated. With this method, I can search and sort my polishes easily (googledocs can be cumbersome on-the-go) and I can store a picture of each polish with each record. This is a long post, but the process is easy peasy. 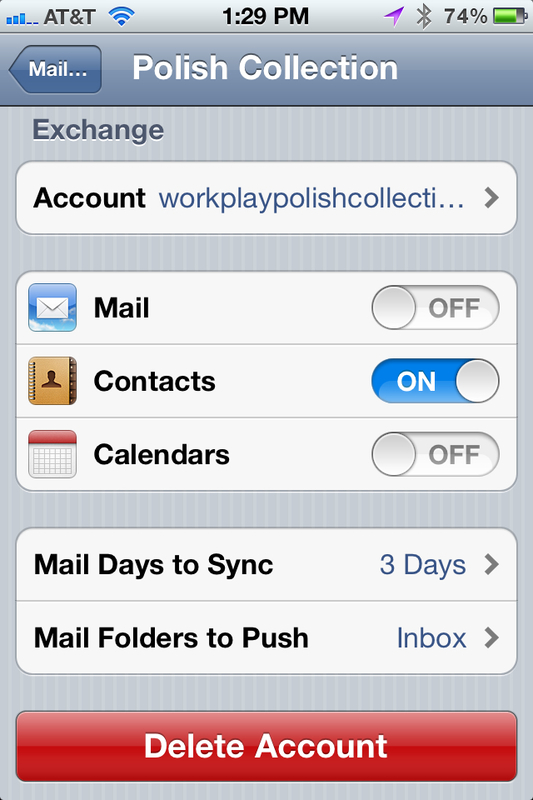 To avoid getting polish names muddled with my personal and professional contact lists, I created a separate gmail account called workplaypolishcollection. I don't receive (or even check) mail at this account. I only use it for the Contacts List. 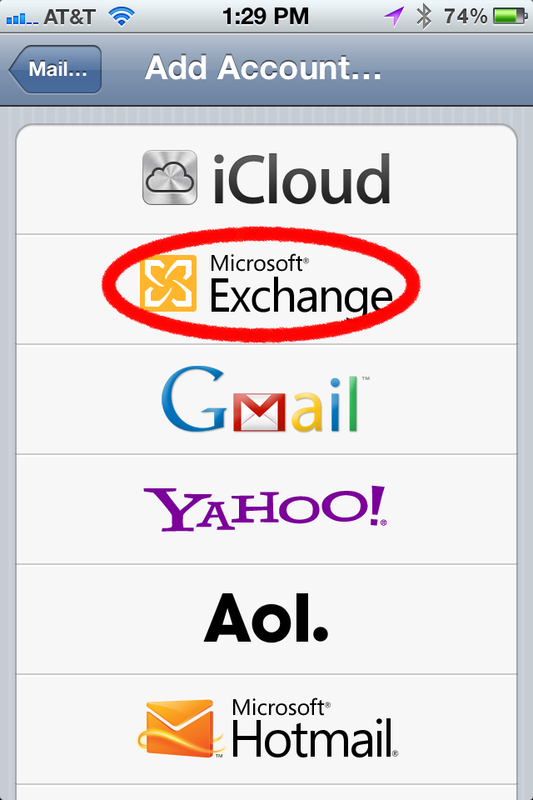 Next, I set up the new Gmail account on my iPhone using Exchange settings (instead of the Gmail prompts). The Exchange Settings will ask you for a server name. Enter "m.google.com". I renamed the Description to "Polish Collection". On this screen, I chose to sync contacts only. Turn Mail and Calenders to OFF. Now when you go to Contacts (the brown icon with a person on it), there will be a separate Contact List at the bottom. Your screen may look different than mine depending on how many other accounts you access from your phone. Click on your Polish Collection Contact List and hit the + button to add an entry. The First Name, Last Name and Company Name fields are "searchable". So I enter the Polish Brand in the Last Name Field, Polish Name as the First Name, and the color(s) as the Company Name. You can scroll down and add a Field if you'd like. I activate the Notes Field and enter the Collection Name, Release Year and Finish. This info isn't searchable, but it's nice to have available. Finally, I hit the Add Photo Button and take a picture of the bottle in good light. I zoom way into the bottle so I can see the polish up close. I find it's easier to do part of this process from a computer (logged into your Gmail account) because I can type so much faster from there. After I've typed the entries...I use the phone to snap the pics. The photos are stored at a very low resolution so the pics won't be that great...but it's enough to jog your memory if you're out and about. 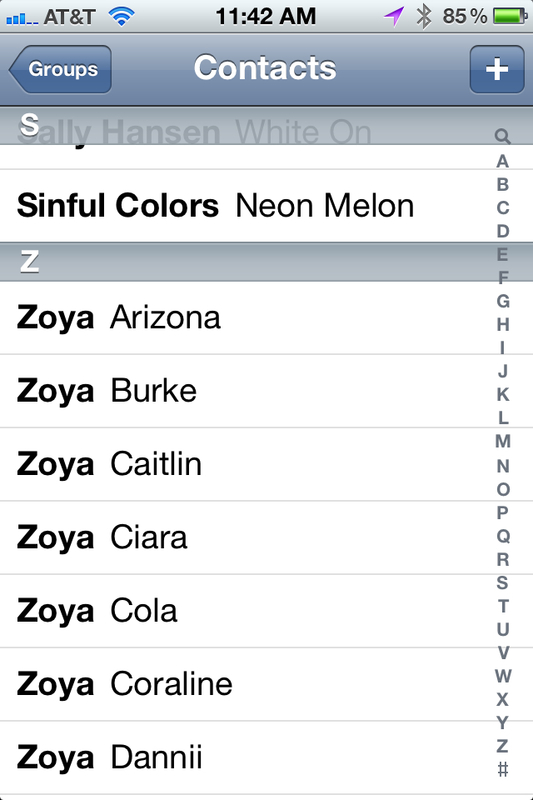 Here's a screenshot of a completed entry for Zoya Arizona. I don't have everything inventoried yet, but I've made it a habit to enter all new polishes as soon as I buy them. Here's a screenshot of the beginning of the "Z's" in my list. The polishes show up organized by brand, then alphabetical by name. *Note: if you view "All Contacts" (which combines every contact from every account), then the polish names will show up mingled in with your friends and families! But no worries. Just view the lists separately. I search the list all the time while I'm out on the run. Here's a screenshot of the results of a search for "Black". 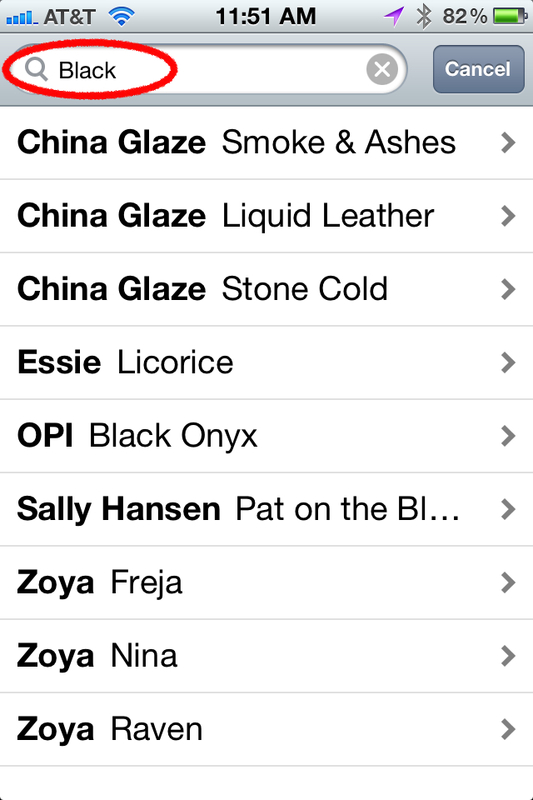 All of my black polishes are listed and I can click on the name to see the rest of the info. Cool, huh? I hope this is useful to someone. I'm assuming the process is similar for an Android phone, but I'm not sure. Also, there may be a way to import contacts into a Gmail account from a CSV file; so if you already have an awesome spreadsheet, you may be able to map the fields and export your entries into this setup. And finally, as promised, here are a few links to some amazing stash spreadsheets.